In this article, you learn about the primary methods for migrating a SQL Server 2005 or later database to a single or pooled database in Azure SQL Database. For information on migrating to a Managed Instance, see Migrate to SQL Server instance to Azure SQL Database Managed Instance. For migration information about migrating from other platforms, see Azure Database Migration Guide. There are two primary methods for migrating a SQL Server 2005 or later database to a single or pooled database in Azure SQL Database. The first method is simpler but requires some, possibly substantial, downtime during the migration. The second method is more complex, but substantially eliminates downtime during the migration. 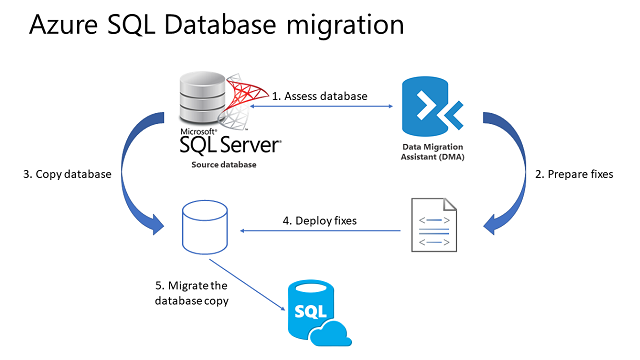 In both cases, you need to ensure that the source database is compatible with Azure SQL Database using the Data Migration Assistant (DMA). SQL Database V12 is approaching feature parity with SQL Server, other than issues related to server-level and cross-database operations. Databases and applications that rely on partially supported or unsupported functions need some re-engineering to fix these incompatibilities before the SQL Server database can be migrated. To migrate a non-SQL Server database, including Microsoft Access, Sybase, MySQL Oracle, and DB2 to Azure SQL Database, see SQL Server Migration Assistant. Use this method to migrate to a single or a pooled database if you can afford some downtime or you are performing a test migration of a production database for later migration. For a tutorial, see Migrate a SQL Server database. The following list contains the general workflow for a SQL Server database migration of a single or a pooled database using this method. For migration to Managed Instance, see Migration to a Managed Instance. Assess the database for compatibility by using the latest version of the Data Migration Assistant (DMA). Prepare any necessary fixes as Transact-SQL scripts. Make a transactionally consistent copy of the source database being migrated or halt new transactions from occurring in the source database while migration is occurring. Methods to accomplish this latter option include disabling client connectivity or creating a database snapshot. After migration, you may be able to use transactional replication to update the migrated databases with changes that occur after the cutoff point for the migration. See Migrate using Transactional Migration. Deploy the Transact-SQL scripts to apply the fixes to the database copy. Migrate the database copy to a new Azure SQL Database by using the Data Migration Assistant. Rather than using DMA, you can also use a BACPAC file. See Import a BACPAC file to a new Azure SQL Database. The following list contains recommendations for best performance during the import process. Choose the highest service tier and compute size that your budget allows to maximize the transfer performance. You can scale down after the migration completes to save money. Minimize the distance between your BACPAC file and the destination data center. Remove rarely queried historical data to another database and migrate this historical data to a separate Azure SQL database. You can then query this historical data using elastic queries. Update statistics with full scan after the migration is completed. When you cannot afford to remove your SQL Server database from production while the migration is occurring, you can use SQL Server transactional replication as your migration solution. To use this method, the source database must meet the requirements for transactional replication and be compatible for Azure SQL Database. For information about SQL replication with Always On, see Configure Replication for Always On Availability Groups (SQL Server). To use this solution, you configure your Azure SQL Database as a subscriber to the SQL Server instance that you wish to migrate. The transactional replication distributor synchronizes data from the database to be synchronized (the publisher) while new transactions continue occur. With transactional replication, all changes to your data or schema show up in your Azure SQL Database. Once the synchronization is complete and you are ready to migrate, change the connection string of your applications to point them to your Azure SQL Database. Once transactional replication drains any changes left on your source database and all your applications point to Azure DB, you can uninstall transactional replication. Your Azure SQL Database is now your production system. Use the latest version of SQL Server Management Studio to remain synchronized with updates to Microsoft Azure and SQL Database. Older versions of SQL Server Management Studio cannot set up SQL Database as a subscriber. Update SQL Server Management Studio. Doing so causes a performance impact on the server. If the performance impact is unacceptable, you can use another server but it adds complexity in management and administration. When selecting a snapshot folder, make sure the folder you select is large enough to hold a BCP of every table you want to replicate. Snapshot creation locks the associated tables until it is complete, so schedule your snapshot appropriately. 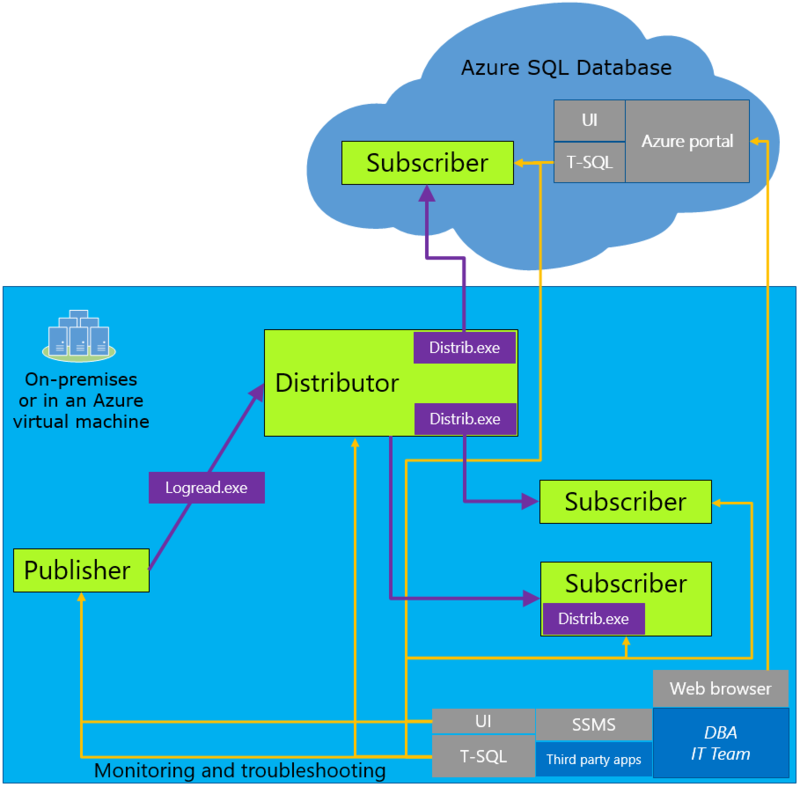 Only push subscriptions are supported in Azure SQL Database. You can only add subscribers from the source database. In addition to searching the Internet and using these resources, use the MSDN SQL Server community forums or StackOverflow. SQL Database Managed Instance enables you to migrate an existing SQL Server instance and its databases with minimal to no compatibility issues. See What is an Managed Instance. Use the script on the Azure SQL EMEA Engineers blog to Monitor tempdb usage during migration. Use the script on the Azure SQL EMEA Engineers blog to Monitor the transaction log space of your database while migration is occurring. For a SQL Server Customer Advisory Team blog about migrating using BACPAC files, see Migrating from SQL Server to Azure SQL Database using BACPAC Files. For information about working with UTC time after migration, see Modifying the default time zone for your local time zone. For information about changing the default language of a database after migration, see How to change the default language of Azure SQL Database.